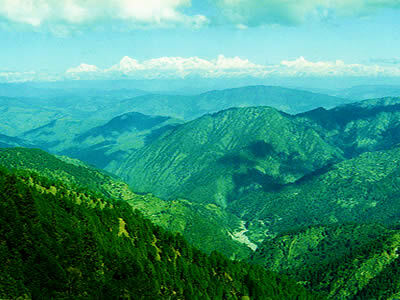 Follow Jim Corbett's footsteps in the jungles of Kumaon! 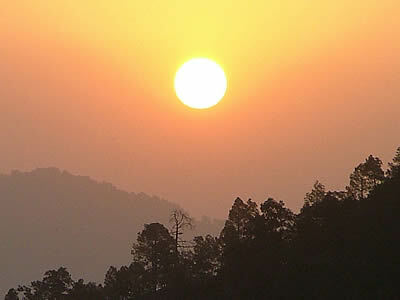 Camp Corbett was built in 1987 and is located near the village of Kaladhungi in the state of Uttarakhand, north India. The lodge is 45 minutes drive from Corbett Tiger Reserve and 6 to 7 hours by road or rail from Delhi. The Anand family, who are very hospitable hosts, have created a jungle lodge which is in harmony with its superb natural setting, overlooking the River Boar and facing the Himalayan foothills. Accommodation comprises 15 double occupancy cottages in a tranquil garden, with a thatched roundhouse at the centre of the Camp. The Reserved forests surrounding the Camp are a paradise for the naturalist, birdwatcher or those fascinated by "Corbett lore". A walk in the company of an experienced guide may reveal pug marks of tiger, as well as sightings of their prey species, the graceful chithal, sambhar and wild boar. Elephants regularly pass through the Camp grounds. The bird life is diverse with 367 species, and includes rarities such as the Great Hornbill, Slaty Woodpecker and Tawny Fish Owl. This is the real “Corbett Country”. The legendary hunter of man-eating big cats and pioneer conservationist made his winter home at the nearby village of Choti Haldwani. It was in these forests where Jim had some of his most exciting encounters, including the "Batchelor of Powalgarh" and "Pipal Pani" tigers. 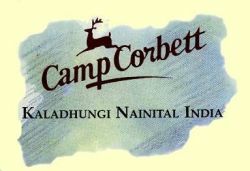 Come and follow Corbett's trails with us! Corbett Tiger Reserve was established in 1936 and is estimated to contain 120-140 adult tigers, although they can be elusive and wary. The scenery here is truly wild and breathtaking - majestic sal forest; wide expanses of elephant grass, and the gorges of the Ramganga river, backed by the mountain ridges of the Siwalik Hills. We can easily arrange half day visits to Bijrani sector or longer overnight stays in the Reserve. Mountain Quail Camp, our associate lodge, is situated at 2050 metres altitude at Pangot, 8 km west of Naini Tal, and is a one hour drive from Camp Corbett along a highly scenic mountain road. You will be made very welcome by Siddharth and Choti Anand, who have 25 years experience of leading our wildlife safaris and treks in the Himalayan foothills with Blaze-A-Trail Adventures Pvt. Pangot is the perfect place for relaxing walks, pony rides or birdwatching in the oak and pine forest amidst tranquil mountain scenery. Hoping to see you at Camp Corbett soon! Our lodges and itineraries are designed for the naturalist, birdwatcher, trekker, or for anyone of adventurous spirit wishing to experience the magnificent scenery and diverse wildlife of the fascinating Kumaon and Gahrwal region of the Himalayan foothills.